This side-by-side is absolutely awesome. Please review the information provided and call our professional sales team toll free at 1.888.385.1122 today with any further questions you may have regarding this unit. The Polaris RZR XP 4 900 delivers 88 horsepower through the ProStar engine which is the highest horsepower in the industry. The 3-link Trailing Arm IRS for a smooth ride and the long wheelbase of 107.4 inches allows for more room for a more comfortable and smoother ride. The Polaris RZR XP 4 900 EFI four-stroke DOHC Twin Cylinder engine is combine with a lightweight automatic transmission for fast acceleration. 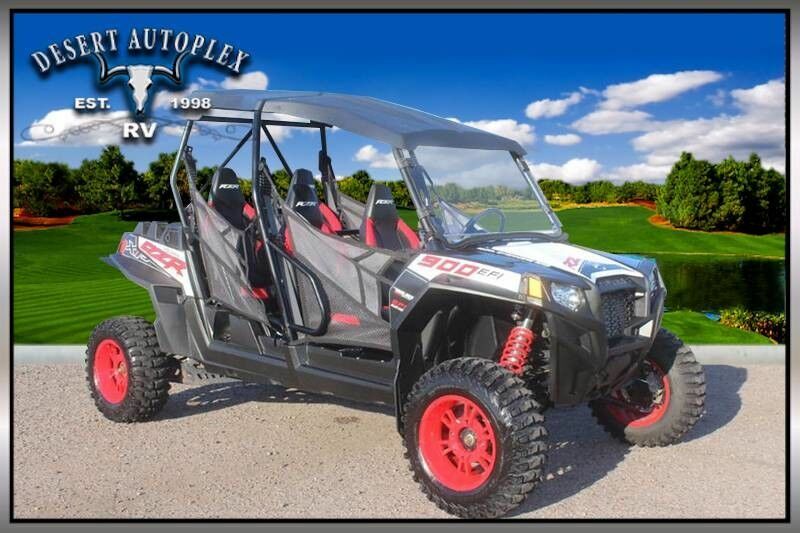 You DO NOT want to miss your chance to own this awesome 2013 Polaris RZR XP 4 900 UTV!! Financing is always available on approved credit, and we will even walk you though your new purchase upon delivery to show you how everything works if you're not familiar already. HURRY, and call our professional sales team toll free at 1.888.385.1122 today!